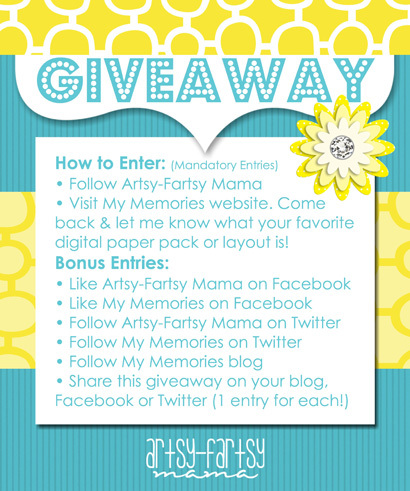 I am so excited to announce Artsy-Fartsy Mama's very first giveaway!! Let me just start by thanking all of you who read & follow my blog, your support means so much to me!! After putting a lot of thought into what I should offer as a giveaway to such loyal fans, I was coincidentally contacted by My Memories and was offered to review their digital scrapbook software and give away one My Memories Suite v2.0 software download to a lucky winner!! Sounds pretty fantabulous, right?! Since I don't really have the time or the money to scrapbook anymore, I just save all my digital photos in folders and try to just blog about it on my family blog (which I have been slacking in, too). I should also add that being a graphic designer, my business consists of putting photos, text & embellishments together - so this software sounded like something that would be fun to try and see how it compares to other programs. To my surprise, My Memories Suite makes scrapbooking SO convenient! It's a simple download, and a plus for me was that it was available for both PC & Mac! 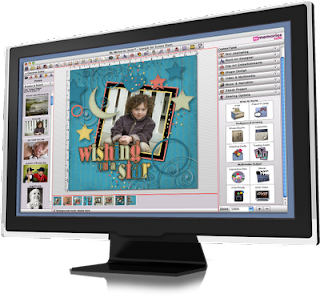 It is easy to use, and perfect for even a beginner digital-scrapbooker. I figured it out fairly quickly, but if you do need extra help, My Memories offers plenty of video tutorials and forums to help you! I also like that the program is on your computer, and is not internet based. The program comes with 1500+ background papers, 1300+ embellishments and 20+ new templates. You can create your own template from scratch or use one of the installed templates. I liked that you can drag & drop photos and that your fonts are automatically installed. If you decide you need more papers, embellishments and kits, you can easily download them from their online Design Shop for great prices. Don't forget to check out the free digital scrapbook kits, too! 1. Visit My Memories website. Come back and leave a comment telling me what your favorite digital kit or template is. *Please remember to include your email with your comment if it's not attached to your profile. I want to be able to contact you if you are the winner! My Memories is offering my readers $10 off the My Memories Suite software for the next ten days! Just use the code STMMMS37162 at checkout! Code expires Sunday, June 12, so act fast! The winner will be chosen using random.org and announced Saturday evening. Time4Me Pack is what I want from their website. 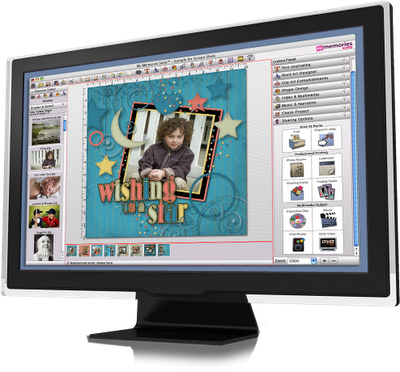 I like so many of the My Memories Digital Scrapbooking Kits that it is hard to choose just one as my favorite! I am definitely fond of the Big Top Pack. So cute! Scrapbooking has kinda been put on the back burner in my life as of recently. With child #2 on the way and lots of other things on my plate, I cant ever seem to find the time or motivation to sit down and get everything out. This win might bring back some of my motivation to take advantage of those valuable minutes I have during the day. I liked Artsy-Fartsy Mama on Facebook. I liked My Memories on Facebook. I am following Artsy-Fartsy Mama on Twitter. I am following My Memories on Twitter. I am following My Memories blog. All of the templates and digital kits on MY MEMORIES are so beautiful, but we are a military family and just recently (literally in the last 3 days) moved to a new post, so I am truly loving all of the military digital scrapbooking kits!!! We have been making an album of our journeys from duty station to duty station and they are all (so far) digital pictures so this would be perfect. Can I say that I LOVE LOVE LOVE that My Memories has free downloads?!?! I "like" My Memories on FB and told them you sent me!! I visited the My Memories website and I really like the Denim and Daisies paper pack. So cute! I "LIked" artsyfartsymama on FB. My favorite template is the All Boy! With 2 boys, it was easy to pick that as my favorite! I like Artsy-Fartsy Mama of facebook. I've shared the giveaway on facebook. I've shared the giveaway on my blog. I love the denim & daisies pack. I like artsy fartsy mama on FB! I like my memories on FB! My favorite kit is the Doodle Love one........too cute!! didn't realize I was supposed to leave a seperate comment for following you on gfc. liked my memories on facebook and told them you sent me. I love the Magical Memories pack- for all my Disney "stuff"! I like the doodle love kit and so many others! I shared your giveaway on my blog! My favorite is summer side walks.